Many of us have experienced doTERRA’s amazing effects that support our bodies and the miracles that come from them. I have to admit, that I get frustrated that I have not been able to reach out to all of you, and share with you all of the benefits that doTERRA has to offer, not only with wellness in our health, but with the personal development and as well the financial freedom. So, I decided to create an email, that will be a great resource and reference to getting the full benefits of doTERRA and when you order, when you share and how to get the most of your back office account. I hope you will keep in your inbox and reference it. I hope to provide some great information. And of course, please email me or call me if you have any questions, I truly am here to help. On my website: http://www.essentialsforlivingnw.com I am beginning to write more on articles to help you as well. Information is always flowing and updating, and it does make it interesting to make sure that you have the best information possible! Blessings to you and enjoy! Revelation 22:1-2 Then the angel showed me the river of the water of life, bright as crystal, flowing from the throne of God and of the Lamb through the middle of the street of the city; also, on either side of the river, the tree of life with its twelve kinds of fruit, yielding its fruit each month. The leaves of the tree were for the healing of the nations. This is where you log in under: mydoterra.com and use your account number and password to place your orders! I invite you to get familiar with the back office! There are several functions of this site that as you poke around, you most are for running doTERRA as a business or simply sharing with others! What is the dōTERRA Loyalty Rewards Program (LRP)? The doTERRA Loyalty Rewards Program (LRP) is a program that provides free product credits for consistent monthly purchases ordered on the program. What is great about this program is you can change up the order, for example by ordering a different oil every month to build up your collection. Many people will order the supplements and the Probiotics and keep those on a regular order for delivery every month. Referencing the diagram above, the LRP is at the lower right in the box, you will see an oval with an “LRP number”. Simply click on this number and up will come your LRP standing order, that you can edit, add and change your next months order whenever you remember to add something! What is so cool about this program, is that it works like the Alaska Airline Credit card. Every purchase (product value points – “PV”) you make adds up to a sort of credit account, and as a participant in the Loyalty Rewards Program, you will immediately begin to earn product credits that can be used as cash to purchase doTERRA products. The longer you participate, the more credits you can earn—up to 30% of your total monthly Loyalty Rewards purchases! (See Loyalty Rewards Program terms and conditions.) See the chart below. The first 3 months you earn $10 back for every $100 you spend, the next set month 4-6, it goes to $15 for every $100 and so forth up to $30 for every $100, and wow, this is in addition to the wholesale account discount of 25% off. If you do not see that you have that box, it is because you do not have a scheduled LRP going. You can create one anytime and you can cancel one any time, by clicking on the oval that says “Create a new LRP”. Please give me a call if you have questions on that. What are the benefits of being on the Loyalty Rewards program? In addition, if you place an LRP order which reaches 125PV (product value) you will qualify for the Product of the Month Club.The Product of the Month Club is a permanent promotion, with a new free product each month! Sometimes you have to pay attention to what the product of the month is, because the value may be requiring a larger than 125 pv, such as the Frankincense oil promotion may require 200pv. As a member of the Loyalty Rewards Program, you may also qualify yourself for more commission opportunities. When you place an order on LRP, your upline then may quality for other bonus commissions. When you place an order that is not on an LRP, not only will you not get commissions, but your upline will not get certain benefits such as power of 3. I love this chart, it really helps me remember what my flexibility is with an LRP. Some months, you many feel like you don’t want to order. If you cancel your LRP, those points will disappear! So before you cancel, make sure you have no points in the account! This will show you on the dashboard area of your back office. 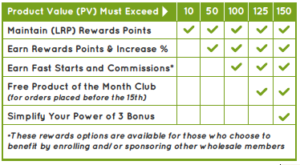 Simply keep just 10 pv and you won’t lose your points. order 50 pv and you will earn, increase points in your account, and 100pv you will earn commissions if you have people under you. 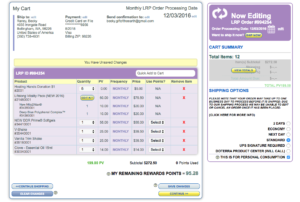 To use points, go to your LRP standing order see below screen shot: And next to my sample order, I have the last 4 items that qualify me to use the points for, simply click on the “Select” button and that will use the points in your account. Note below: at the very bottom, there is a line that says “My Remaining Rewards Points”, this will show you how much you can use, you don’t need to use all of them, you can hold them, but I would recommend you use them often because can expire after a year. Mine shows 95.28 points I can use! That is almost $100 of free product! 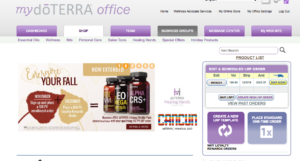 Also note, doTERRA is rewarding the shipping amount as well for loyalty reward points. Make sure when you order, click on the box at the far right bottom that says, this is for personal consumption, because this will decide what tax will be assessed on the order.